Plated in that special Sterlingcraft(R) finish that never needs polishing so you can spend more time on preparing and presenting foods than on polishing and cleaning. Measures 12-1/4' x 9'. 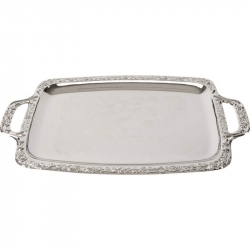 Entertain with flair with the Sterlingcraft(R) Oval Serving Tray! Plated in that special Sterlingcraft(R) finish that never needs polishing, so you can spend more time on preparing and presenting foods than on polishing and cleaning. 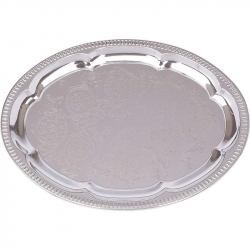 This 9-3/8' x 6-3/8' oval tray is ideal for serving hors d'oeuvres, petit fours, or home-made candies. 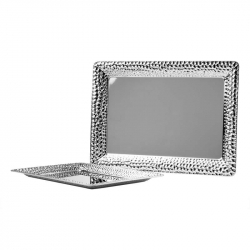 The Sterlingcraft(R) Oblong Serving Tray features that special Sterlingcraft(R) finish that never needs polishing. The roomy tray surface will hold treats, canapes, or hors d'oeuvres for holiday parties, special family occasions, and the weekly book club meeting. Two hostess handles made for easy carry make this a perfect party tray. Measures 17-1/2' x 10-1/2'. 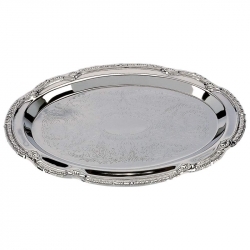 All the elegance of silver with none of the frustrating upkeep, the Sterlingcraft(R) Oval Serving Tray is perfect for special occasions, or making any occasion special. Plated in that Special Sterlingcraft(R) Finish that Never Needs Polishing. 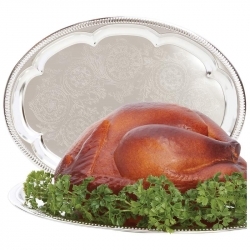 Measuring 18' x 13-1/2', this tray is large enough to hold a huge Thanksgiving turkey. Kitchen Pride 2pc Hammered Edge Tray Set.